We went to Pete's Big Sendoff on the Summer Solstice. Sad to see him go,but happy thoughts and celebrations of him and how his actions had touched so many. Songs were sung, and,as he had chosen a while ago, "Always Look on the Bright Side of Life" by Eric Idle was sung led by his daughter and son and joined in by the 300 or more of the rest of us. He had been to a burial at the Memorial meadow a while ago and said he'd like it here, with the sheep grazing over him in the Winter, at the top of the slope with a good view of the rolling hills of Gwent. He has a view of a field of barley and a wooded slope as well,for a man who planted trees. All that,and as a potter...it is good clay soil. Then up the road to his local pub, where a sign greeted allcomers..we are sorry but the kitchen is closed today as we have lost our great friend Pete. Inside a great Pete style buffet awaited and people played boules outside..the only sport Pete had won an award for! The weather was perfect for doing as he had ordered..talk to three persons that you'd never met before...and to many old friends. One comment came from many...you just expected him to come round the corner and say "and how are You today?" It was a great Sendoff and left you feeling sad but glad. He always said he'd never reach 65..
sewing hard to finish Woodchip's quilt before we go to stay with Carpenter and family. 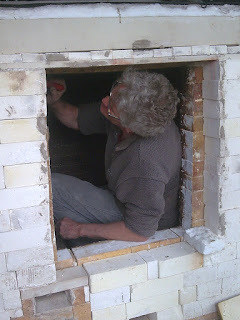 Potter, friend for 44 years, mover of Art running his company Artworks, previous director of the International Ceramics Festival in Aberystwyth, Big Pete will leave a massive gap in many hearts all round the world. Died June 1st, the first day of Summertime, aged only 61. Taken just now, at about 10.15 pm,(BST), looking towards Rothesay and the Bens. We had two days going round Spring Fling this year, starting with Hannah and Dougs' workshop at Lochdougan House. It was good to see four studios open there, one painter,one painter/printmaker and a fused glass artist. On via Christine Hester Smith at Barnbarroch (and good coffee and flapjacks!) where Wendy Kershaw was the visiting clay artist again. We stopped in Kirkcudbright for a late lunch by the Harbour...and ended up staying there overnight, rather than driving home and returning. It is a fascinating wee town with much history, including being known as an Artists' Town. Many have settled here, visited, been inspired by it over the past 120 years and more. I was fascinated by all the doorways and ginnels. There are still fishing boats working from here, mainly scallop dredgers, but only about half a dozen.